I really thought that Beau and Landry are both very loyal and kind people. Landry has always done the right thing; she has wonderful parents and struggles like the rest of us with one thing or another in life. Right now, she is over her head in school debts and needs a good job. That job just ends up being the nanny for Beau Montgomery, a NASCAR driver. Sparks fly the moment the two meet. But Landry feels like it would be crossing the line to have a relationship with someone she works with. Beau feels the same. Too bad neither can do it! Beau has a child, Mia, who came from a relationship he had with Paisley, who Beau was faithful to, but Paisley wasn’t someone who could be tamed or tied down. Beau finds out the daughter she had may or may not be his. But Beau falls in love instantly with Mia and doesn’t care if it is his or not. To Beau; he is the father. He is utterly in love with that baby girl and does right by her. He is a good father. He is also not like the person that the press makes him out to be. Beau was raised by his mother until she committed suicide. Beau was then taken to live with his father and step mother. His step mother was kind and Beau was nice to her as well since Beau’s dad was married to her when Beau’s mother got pregnant. Beau’s dad was another famous Driver and a womanizer. Sounds like a soap opera huh?!! Eventually Landry and Beau get together and have some hurdles to overcome. What I liked: I loved how Beau was a good dad and kept his ex in Mia’s life. I loved how kind and sweet, Landrey was. I enjoyed watching people grow and right mistakes made. I also liked that Beau and Landry promised that they would never lie to each other and didn't. They did have the best makings of a great forever relationship. What I didn’t like: Beau and Landry’s bedroom scenes border on raunchy to me with the talking. They just don’t seem that way to me. I had to skip over it. And there were some medical errors too. Since I am in the medical field, I can ignore a lot of things and some I just can't. 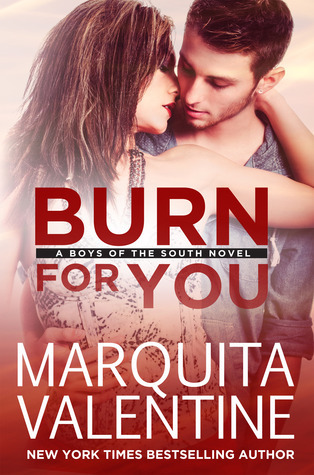 April 23, 2014 - Marquita Valentine and Sawyer Bennett are co-hosting Marquita and Sawyer’s Double Release Celebration on Facebook. There will be fun discussions, they will be answering your questions, and there will be prizes! The event begins at 9:00 am EST and will last all day.